The oldest parts of the small Church of All Saints here probably date back to the Thirteenth Century, the earliest stone work in the Nave from about 1220 AD. Although it has been added to and restored it is generally a plain and simple place, but here and there are a few delightful figurative carvings, mostly headstops at the ends of the hood moulds which arch over the exterior windows and doors. Since we first moved here I have been completely fascinated by these curious heads which have been staring out over the village for centuries. I think there are about 10 of them, some so weathered that their features are almost non-existent. Every time I walk through the churchyard I say hello. I am not sure of the dates of them but some of them would certainly date back to the earliest stone building. Fridays Sketches: Carved headstops from the exterior of Grafham Church, roughly sketched in the cold churchyard with some added tones back at home. It’s an odd thing but I feel I will have to do these again and much more accurately. The human heads will, I am sure, have been carved with a person in mind and somehow I owe it to them and their long, cold, vigil to get it right. One of the two creatures on the bell tower window. What have these quiet watchers seen? Love, life, birth, death, happiness, sadness, famine, feast, sickness, health, wealth and poverty. They have survived storms and droughts and the mixed fortunes of this small village. I wonder who carved them and who else they have conversed with over the years. I am extremely fond of them. I spent a day, in 2012, drawing in and around the church, see Another Sketchbook Day. Reading it again I see I was as curious then about what the watchers had seen. How you you not be? I try to walk most days and have only missed two since Christmas. Yesterday it was dull with misty drizzle. The sweet woodsmoke from the houses lay heavy in the lanes. In these dark afternoons the woods smell warm, peaty and mossy. It is somehow comforting. Colours are subdued and monochrome, so the old white spiral tree protectors shine out. They are mostly split now as the trees have expanded. Some blow about in the undergrowth or like this one have been assimilated into the tree structure. In this case two trunks have grown very close together trapping the protector as it split. I have a few pieces of these curled shapes, they are lovely to draw. A trick of perspective gave this one a wan face, a poor trapped thing, its grasping arms never again to meet, as the tree relentlessly expands. This black and white pony grazes in a field down the lane. It is the same field that had the lost gloves on the posts. There is only one glove now and I think possibly the other one is inside the pony. It would have been tempting to nibble at the waving fingers. It is very black and white with a sprinkling of mud too. In the half light of late afternoon it is almost lost in the far hedge. There is a lot of dog walking here and in this cold weather dogs need coats. This man and his two little terriers were walking in front of me yesterday. I meet them quite often. I might draw them again and add a bit of colour as they both have red tartan coats. We had two bright and sparky little Jack Russells in our family, so the way they move is familiar to me, especially that unmistakable terrier bounce. Sometimes they seem to have all four feet off the ground. Ours used to race about on three legs. There never seemed to be enough time in their busy lives to get that fourth paw on the ground. A week of sketching and other things …. We have a least two in the Village.. probably more but I have yet to meet them. I sketched these two handsome beasts today, on a bright sunny rain-free morning. I don’t like hanging around outside peoples houses so these were very quick and approximate. They live on a cottage roof from where, at night, they take wing. Actually I think one of them is a gryphon. They are mostly silhouetted as the path is on the north side of the house. They have different take-off points The big dragon is poised at the end of stepped tiles and the smaller gryphon crouches at the bottom of a curving slope. I have admired them since we came here. They sit very well on their cottage. Pen and Ink Sketches: A5 sketchbook. What can this be?.. Why, a pig of course! GK Chesterton liked pigs.. this is from “Rhapsody on a Pig” published in the The Illustrated London News, 8 May 1909. I think it would be fair to say that G K Chesterton himself had some of those very same luxuriant contours. And he is so right about the pigs. Those gorgeous soft curves and that wonderful spread of weight as they lie down…. Sleeping pigs…well, most of them. It’s pig week for me over at Beautiful Beasts. I have spent hours experimenting with different combinations of the images and backgrounds. It is a very good exercise for learning about overlays registration etc. I will post more of the stages on Printdaily next week, but for now here are four fossils prints based on the fragments I found here at Grafham. I am not quite finished with the fossils yet and am playing about with ideas for a small concertina form which will use the single prints in some way. This was a first rough idea. I hope to get something more done next week. I do like these little book forms. Today is my day to contribute to Project Two Thousand and Fourteen. It’s a great visual online project set up by Nicola Fitzsimmons. Each day a different artist makes a piece of work in response to a news item. It’s a tight schedule which I always rather like. The work to date is great, very varied and fascinating. I started early listening to the news with my sketchbook by my side. There have been so many dreary things on this week but I was struck by all the mentions of fires from all over the world. A pile of tyres in the UK whose smoke could be seen from space, wild fires in Australia and California. Then there was the fracking debate, a further report about gastric band surgery to cure our ever growing obesity problems… Hmmm. I wondered about the Earth, trying to rid itself of the burdens of pollution and an increasingly heavy population. Then at 2.30 I started thinking about the NSA and the collection of data etc. so sketched these American Eagle claws loosening their grip on the net. But on reflection we don’t think that Obama’s reforms will really address the main concerns that such overarching and deep surveillance brings, particularly to non US citizens…so there would have to be question mark against this image. I had hoped to make a print of this but just ran out of time. However I do have other plans for this image. It was a really interesting project to do and I may do some more, just for my own pleasure. It’s good brain work, forcing you to consider images that you perhaps would not normally tackle, and the deadline is great. I have been thinking about puppets recently and you know how it is, when you have something in the back of your mind, you tend to see related things everywhere. Down the lane towards the reservoir there are two lost gloves. They have been there for a couple of weeks now. Someone will eventually take them but for now they have been put on the top of two adjacent posts. I sketched them on Friday. 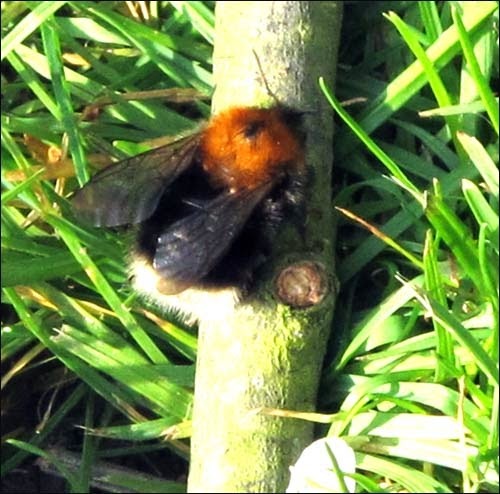 It was very windy and in the wind the loose woolly fingers flapped, silently gesticulating to each other. They look as though they are having a silent conversation. I made some more drawings. and then a small watercolour.. The Lost Gloves … talk to the hand …. Fairy Money, Snake Stones, Devil’s Fingers…and Bertie. I am continuing my explorations of the fossils that can be found here at Grafham. So far I have found Gryphaea, Belemnites, bits of Ammonites but as yet no sections of Crinoid stems. They are a common find but I need to take some more time to look as they are tiny..but unexpectedly very beautiful. Some are simple and circular in sections and some are star shaped. Photograph from the British Geological Survey website. If you are lucky enough to find a more complete fossil it would be rather like this. These elegant creatures visualised in a Crinoid Meadow diorama from Illinois State Museum. Image from the Natural History Museum again. The Natural History Museum site have a whole section of very good, concise info on the Folklore of Fossils, covering different countries and different uses for and superstitions about fossils. It’s fascinating, and a good starting point for more research. Ammonites are particularly interesting with their beautifully coiled shape. It’s not surprising that they were known as snake stones. But I am fond of snakes so was dismayed to discover that they were thought to be the remains of snakes, cursed and turned to stone by St Hilda. And then to add insult to injury they were subject to a beheading curse by St Cuthbert. All this to account for these curious curled and apparently headless things found in abundance near Whitby. I have written about this snaky connotations over at Printdaily. See Ammonite:The Curious Snake Stone. 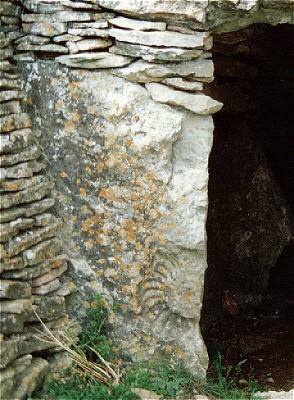 Ammonites occurring in architectural stone are quite common but it is thought that this ammonite imprinted stone was specially selected for the entrance to Stony Littleton’s Neolithic Chambered Long Barrow. From Chris Collyer’s completely fascinating Stone Circles UK website. It’s all very inspiring for an artist (especially one with leaning towards the dark side) but for the meanwhile here are a couple more of my simple fossil inspired experiments for this week’s Beautiful Beasts work. I had made three different possible background plates, fronds, wavy lines and a circle and then the lino was a 2 colour reduction. Frond background and first printing. Circle background, first lino print was rotated and reprinted. Then second colour added. Chris said “what are you calling it?” “Bertie the Belemnite.” I said. Oh dear, it just slipped out. I am supposed to be a serious artist but I guess it will stick, as these things have a tendency to do. With wavy background and two colours. I will post more of the process on Printdaily soon. And to end, a glorious bunch of Berties on the Bench. I have been lost in fossil land for the last few days and it is completely fascinating. I returned to the shoreline and have come back with some more treasures; some fragments of what I think might be Ammonites, a few pieces of Belemnites, more Devil’s Toenails and some bits of what might be coral. Like the Gryphaea, the Belemnite fossils were also thought to have various different origins and properties. The strange smooth shape gave rise to names such as Devil’s Fingers (more delightful devilishness), sword stones and gnomes candles but most wonderfully, they were thought to be thunderbolts, arriving after thunderstorms. Both Gryphaea and Belemnites were thought to have healing properties, for joints and oddly for sore eyes… more folklore to come. The reason we have these fossils is because of the Oxford Clay which lies under the Boulder Clay. Palaeontologist and Palaeoartist (very cool) Mark Whitton has a couple of excellent blog posts about the Jurassic Oxford Clays here. This image from his blog shows the extent of these treasure filled clays. 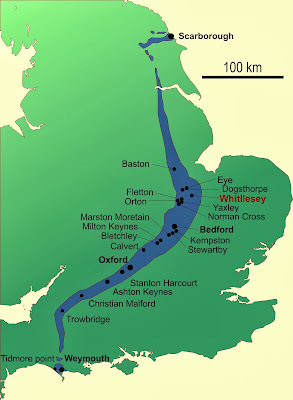 The extent of the Oxford Clays. Talking to local people there are fewer fossils here than there used to be as the banks have been shored up with boulders to stop the erosion, but there must still be quite a few and I have only cast a very untutored glance over the shoreline. I am trying not to let this get obsessive but I can see how you might get the fossil hunting bug. On the creative front I did get some printing done. This is the result. You can see how I got there at Printdaily: Gelatine and Lino Print Combo. Devil’s Toenail. 4 x4 inches. “Beginnings” are always exciting and surely nothing can be more exciting than the earliest forms of life. Fossils, I thought might be the perfect place to start my year of exploring the world of Beasts. This first week then will explore my local fossils. I live by Grafham Reservoir whose shoreline is littered with shelly fossils. They are mostly Gryphaea remains, otherwise known, delightfully, as “devils toenails”. This beautiful image is from the Natural History Museum’s page on the Gryphaea of Lyme Regis. The ones we see here are much more weathered and misshapen but there is still the magic feeling of handling something so very ancient. They are from the early Jurassic period approx 199-189 million years ago. There must be millions of them here. A typical piece of the “shingle”in today’s sun. It’s mostly made up of bits of graphaea from a bay on the reservoir that I, really creatively, call Devil’s Toe Nail Cove. Devils Toenails 2012 Sketches from earlier P&L post, inspired by their odd shapes. In life the Gryphaea were bivalves and relatives of our oysters. GRYPHAEA (or Devil's Toenail): An extinct genus of bivalve. It is believed to have been an unattached recumbent recliner on the sea floor, with its very own self-righting mechanism if a strong current knocked it out of the sediment. “As a bivalve it possesses two valves. The valves are markedly unequal in size and shape, the left valve is strongly incurved, the right valve is small and flat. The left shell is thick and its surface is marked with numerous ridges. Having read this, it now makes more sense of the shape. I did find one today with a fraction of the “lid” intact. See the drawing top left. It explains some other odd shaped things I have found. The name does seem rather obvious when you see the gnarled and twisted shapes. Some may have thought they were the actual toenails of demons. In that case there were legions of demons around Grafham, which could account for quite a bit. More about these strange creatures, other local fossils and their inhabitants tomorrow. It’s been wild here, wet and windy. On Friday, in the darkening late afternoon I slipped and slid my way up to the track behind the reservoir. To the west the sky was smouldering with remnants of the sun. I had cleaned out the fire earlier that morning and was struck by how brilliantly the dying embers glowed amongst the black ash. This sky was the same. The wind was tremendous and deafening. Rooks and crows hung motionless, facing into the wind then were tossed away and intermittent blasts of icy rain splattered my cold cheeks. I thought I should turn back lest I get blown away, shredded by flailing thorny brambles, snatched up by dark forces or just sucked into some slippery and bottomless clay bog. But this type of weather has its own seductive beauty. It is exhilarating and elemental and dangerous. It makes you imagine that you too are wild and free. I am getting back to sketching and carry a small sketchbook in my pocket, so in the shelter of the wood I made these quick sketch notes. Dark clouds rolling away over to the horizon. The bare stems of cow parsley are light against the dark land. Choppy waters with bouncing ducks. Swampy inland pools with ducks, just like the mangroves in FLA.
A5 sketchbook, Pilot Vpoint and a waterbrush. After 6 years of patching up, adding on and dabbling with HTML it was time to shake up Pencil and Leaf to go hand in hand with (hopefully) a new website. I had looked at the blog recently and thought this is all way too cosy. So it is a little different now, and what a relief. It’s like cutting your hair or pruning an old shrub, letting in the air, the light and space for new development. I could not part with the Lizard so it was just a redraw and redesign. However I am no web designer so it’s an excruciatingly slow process and still in progress. The website, simple though it is, will be some time yet. But I like having the different blogs and sites… They are like starting new and exciting sketchbooks and are far more organised then my hellish piles of notes and sketches.